The images of the two capitals always took up a large part in the work of Russian artists. At this point it is impossible not to quote Pushkin: "Moscow — how much has merged together In this sound for a Russian heart!" and "I love you, citadel of Peter's…" The beauty of Moscow and St.Petersburg, their originality and historical destiny have always attracted artists. 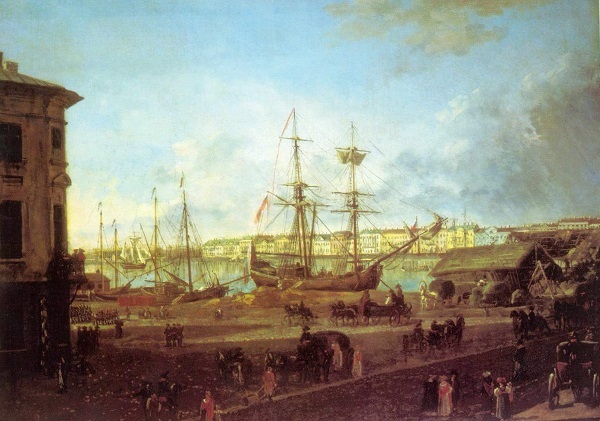 The urban landscape received special development in the painting of the XIXth century, when it became an independent genre. The founder of the Russian city landscape is thought to be the artist Fyodor Yakovlevich Alexeyev. It was he who managed to remove the meagre documentary that prevailed in the paintings of the previous time. Alekseev's works are distinguished by a peculiar perspective, which goes into the depth of the composition along the diagonal, so the vanishing point is located outside the picture. This method allows to achieve maximum naturalness in the transmission of the image. 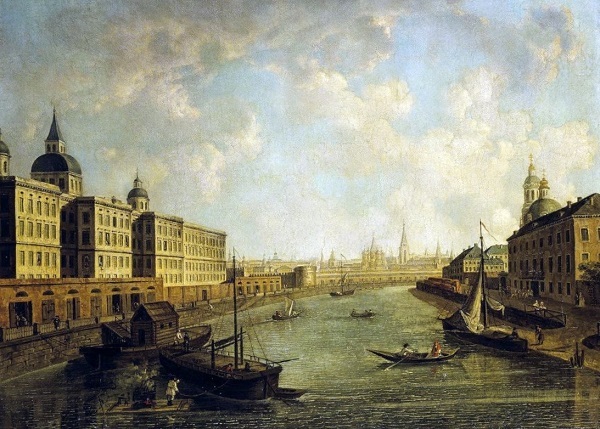 From the artist's pen came out the views of many Russian cities, but his most inspired paintings are dedicated to St. Petersburg, which by this time already acquired the appearance of a complete architectural ensemble. 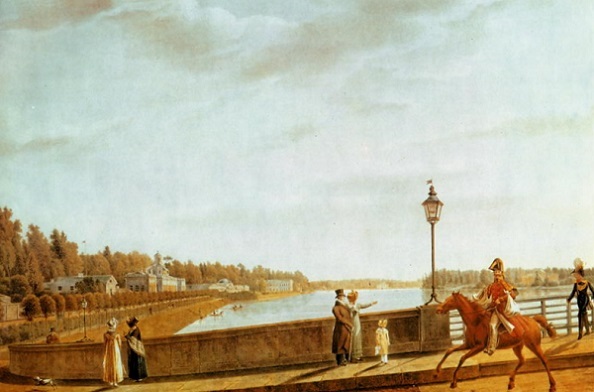 Favorite motive of Alexeyev is the Palace Embankment from the Peter and Paul Fortress. In his urban landscapes, he documented exactly the structure of St. Petersburg architecture, the languid surface of the Neva and the slowly floating boats. But for all his documentary, his paintings have great artistic value. In St. Petersburg works of the beginning of the XIXth century Alekseev conbines the city landscape with the daily life of the city. In 1800 the Petersburg Academy of Arts directed the artist and his two students to Moscow for sketching its historical sights and antiquities. During this period Alekseev was influenced by classicism, so he tried to give Moscow architecture the geometricity and severity of Petersburg. His paintings are distinguished by a balanced ratio of architectural objects and a clear allocation of the central parts of the composition. The Moscow works of Fyodor Alekseev coincided with the renewed interest in the history of Russia. Ten years later, the artist visited Moscow for the second time and created a new series of landscapes. In addition to its undeniable artistic merits, its Moscow cyclus also has a great historical value, as it shows the city before the fire of 1812. The urban landscape in Russia is inevitably connected with lithography. Of great interest are lithographed views of St. Petersburg and its environs, created in 1820 - 1830 by S. Galaktionov, A. Martynov, K. Beggrov, K. Sabat, V. Sadovnikov. Their works, which are distinct in a strict graphic manner, accurately convey the originality of the capital. Other architects also often created the watercolor and pencil sketches of urban landscapes. But beside real buildings, they often painted project ensembles. The most interesting are the watercolor and graphic views of Petersburg, created by A. Bryullov and A. Voronikhin, and Moscow by O. Bove. In the middle of the XIXth century, in the painting, classicism was replaced by romanticism. This trend is reflected in the urban landscape - great attention was paid to various phenomena of nature: sunset, twilight, moonlight, thunderstorm. All this should give the city an atmosphere of mystery. The most romantic image of the city is revealed in the works of Maxim Vorobiev and his students. Some of his best paintings are "Pier with Egyptian Sphinxes on the Neva at Night" and "Autumn Night in St. Petersburg". The first picture illustrates the night Petersburg, which is illuminated by the mysterious light of the moon. 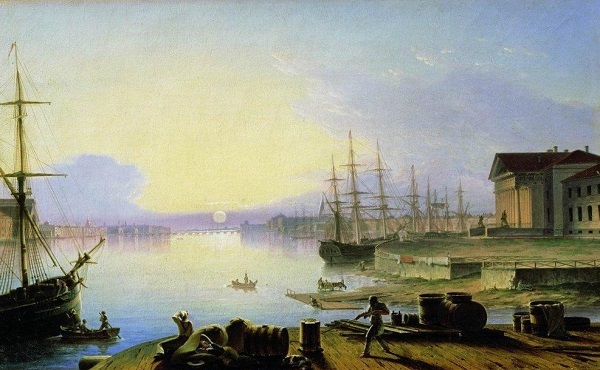 A romantic city landscape also can be found among the works of the famous seascape painter I. Aivazovsky. In the painting "View to Moscow from the Sparrow Hills" the ancient capital is more like an illusive mirage. In the second half of the XIXth century, not only images of the central parts of the city with aristocratic palaces appear on urban types of Moscow and St. Petersburg, but the city suburbs with the houses of ordinary people, and the determining role from architectural forms passes to genre elements.